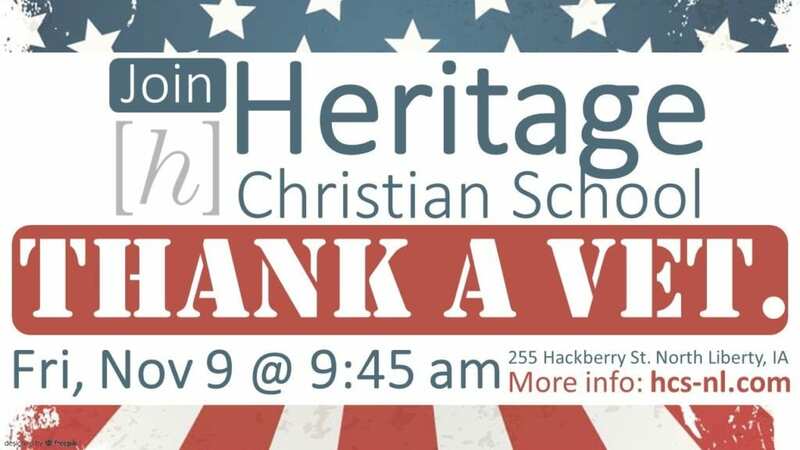 Heritage Christian School is hosting our Veterans Day Celebration on Friday, November 9 from 9:45am-11:15am. As part of an annual tradition, community members and parents join the students and staff of Heritage Christian School to honor and thank present and past members of the United States Armed Forces. Classes are suspended for the day as the entire school participates in the half-day program. The program features instrumental and choral performances, an Armed Forces Salute, presentation of the colors by the University of Iowa Army ROTC, a speech by Iowa Air National Guardsman and Heritage parent, Josh Nimmo, and personal recognition of all veterans present at the event. At the end of the event, each Heritage student shakes the hand of each veteran in attendance, thanking them for their service. It is a very memorable and special event that you will not want to miss.